The tsuba of Miyamoto Musashi himself! Handmade, the blade is thick and comes extremely sharp. Like the more expensive models this blade can even be bent 45 degrees. To keep costs low the tsuba on this model is made with a machine process instead of using a handmade tsuba (as seen on the Elite series). The tsuba and other fittings look very good and are well suited for this model. This sword is well balanced and the tight handle wrap feels great. Comes complete with a black cotton storage bag and Musashi retail box. I'm no expert, but this feels like a nice sword. It gets knocked down a couple stars for BUD-K engraving. I bought this about three weeks before my son's birthday, to be engraved with his first two initials (MH) and last name. The sword was nicely engraved, but it came as MY instead of MH. They quickly sent a replacement with the correct engraving, but font twice as small as the first engraving. I initially thought they forgot to engrave until I put my glasses on and saw the small print. Now a few days before the birthday, BUD-K can't get another replacement out on time, but offered a 20% discount. So I offer up my experience to be wary of engraving items at BUD-K. Evidently, a half-a$$ed job hinges on who gets the order in the warehouse: large font, but misspelled... or spelled right and so small you need a magnifying glass to see it. I bought this to replace a Musashi 1045 steel Katana I bought . I am glad I did, it is far better than expected. On top of that, it is beautiful to behold . 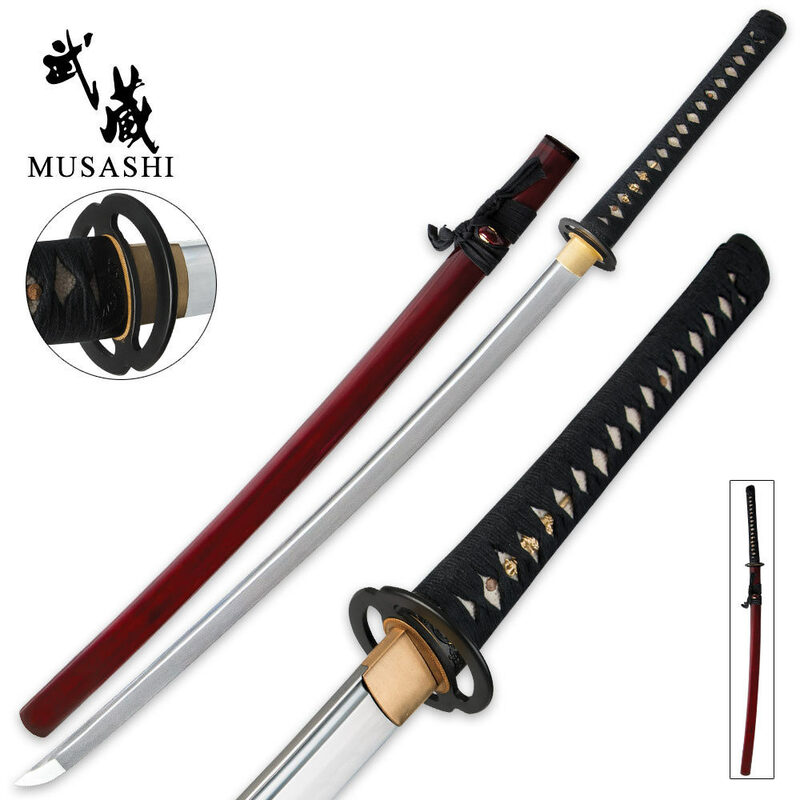 I have this blade and also previously purchased the Bamboo Warrior one. Budk sends only the very best when it comes to Musashi. Beware of other sites advertising Musashi and what you really get is a not so bad but inferior quality Musha. A very beautiful, functional sword. I am impressed by the quality of the sword, and the quickness of the shipping. Everything about this great, except it is pretty dull. the blade isn't very sharp, and I was expecting (told) that it would be sharp. It has difficulty cutting almost anything due to the dullness of the blade. I also wish I noticed that I could engrave it, I didn't notice that, and I really wish I took that opportunity. I can't wait to get this sword on my front door. Lol. I am so excited! True swords, you guys are the best for price, quality, and speedy shipping. I have purchased a few already and I know this beauty is gonna be my favorite!!! Very solid sword! For $99.99, the price is hard to beat! What surprised me the most was how light weight the sword is. I was expecting it to have more weight to it, but the overall feel of it is balanced well enough for any light or heavy usage. The sword is also a beauty to look at. 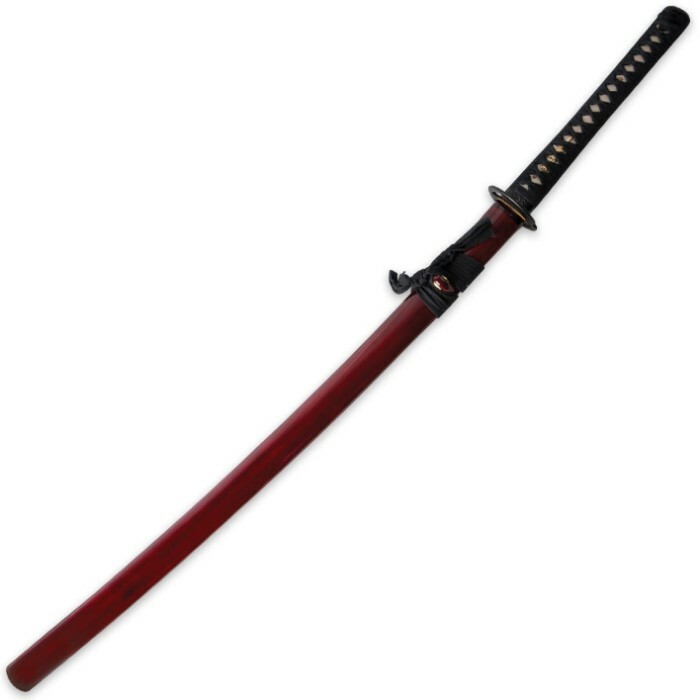 I really love the nice gloss of the burgundy red saya, it contrasts the black tsuka very well. I am really happy with my purchase and I don't think I could've found another sword for this price and quality. I love this katana, and trueswords did a great job on the delivery. It was shipped relatively fast, and arrived early in the morning on the date it was estimated for. The sword itself is unbelievably good quality for the price. Musashi Swords is a legend for being able to do this. The hamon is definitely 100% natural, it wasn't bent or kinked and didn't have any deformities to speak of. The fittings are excellent. With cheaper swords, you'll usually get a "rattle" from the Tsuba (hand guard) or habaki being loose, but not with this sword. 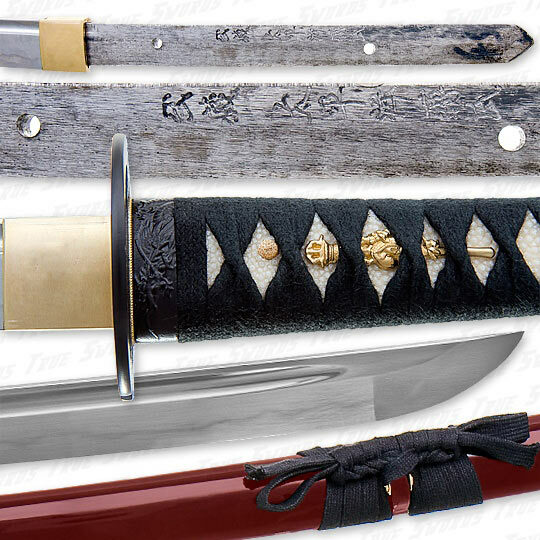 The Tsuba (hand guard), Habaki, and seppa (spacers) are all extremely well fitted, and don't rattle at all. The fit between the Saya (scabbard) and the habaki, are so perfect that the sword doesn't even fall out of the saya even when turned upside down. I cannot find anything bad about this sword at all. It is perfect, and you cannot find anything better for this price, heck, it even beats other swords that are even more expensive than this one.